For the world in general and America in particular, the evidence of violent acts is all too prevalent and pervasive, from Columbine to Virginia Tech to the latest, in Kentucky, in churches, movie theaters, concert venues and schools, virtually anywhere. Playwright Julia Cho has tackled this disturbing topic head on, caught in the crosshairs of a gun, with that pistol held snugly in the hand of a solitary figure cloaked in isolation and mystery. Prepare yourself to be placed in the middle of the confrontation and be ready to duck when the bullets realistically and metaphorically start to fly. In Julia Cho’s intense drama “Office Hour,” you are in an instructor’s office at a university as she attempts to reach out to understand the motivations of a student, one who dresses in black, hides behind sunglasses, a hoodie and a baseball cap, and refuses to participate in class. As a loner who isolates himself from his classmates and writes inflammatory and disturbing assignments, he is presenting himself as a danger…to himself and to others. Gina, who leads an English writing class, has already been warned by other teachers that Dennis is a problem. Jackie Chung’s Gina feels she has to reach out to Dennis and try to find areas of commonality. They are both Asian and share an immigrant background. Writing is important to each of them. She requires each student to attend her office hours and feels this is an ideal opportunity to reach him, and cause him to open up and explain what he feels and who he is. The thought that he could explode is real and she fears for him. Daniel Chung’s Dennis is clearly disturbed and when his facade starts to crack, he admits that he feels “dead” inside. He can’t even look at himself in the mirror. He is the poster child for being unloved, by himself and by the world. To what extent can Gina venture before she puts her own life in danger? Her colleagues David (Jeremy Kahn) and Genevieve (Kerry Warren) have tried and failed to reach him. A series of frightening scenarios play out on stage, any or all of which could actually take place. The dark shadows of Newtown echo in the narrative. Long Wharf has even partnered with Sandy Hook Promise, a nonprofit organization devoted to preventing gun violence, to generate conversations about preventing future tragedies. To say this is timely drama is an understatement. These incidents of violence are all too common and steps must be taken to understand why shooting a gun is thought to be the answer by these alienated individuals. Here is a play about communicating with "the other,” about humanity, about fear. Lisa Peterson directs this confrontational theater experience that resonates all too painfully to our lives. For tickets ($ 35.50-91.50 ), call Long Wharf Theatre, 222 Sargent Drive, New Haven at 203-787-4282 or online at www.longwharf.org. Performances are Tuesday at 7 p.m., Wednesday at 2 p.m. and 7 p.m., Thursday at 8 p.m., Friday at 8 p.m., Saturday at 3 p.m. and 8 p.m. and Sunday at 2 p.m. and 7 p.m. 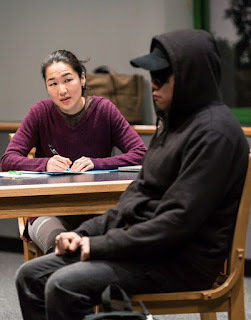 This is a co-production with Berkeley Repertory Theatre in California and takes place at Stage II..
“Office Hour” grapples with good and evil and humanity, with a teacher and a student, with a moral dilemma about how we can make things better. As director Lisa Peterson views it, it is “a brilliant fractured communication that must be experienced." PLAY WITH YOUR FOOD CELEBRATES LOVE!